The thing about the Multiverse is that it’s big. It’s really, really big. Incorporating, theoretically, an infinite number of realities and actualities that exist to counter and take account of every action and reaction, the Multiverse exists on an unimaginable scale. There are numberless different versions of you, me and everyone else who fulfil every potential choice, career and life decision that we could ever possibly have made and if you think about the sheer complexity of the concept for too long, you’ll feel your brain slowly begin to overheat and melt. 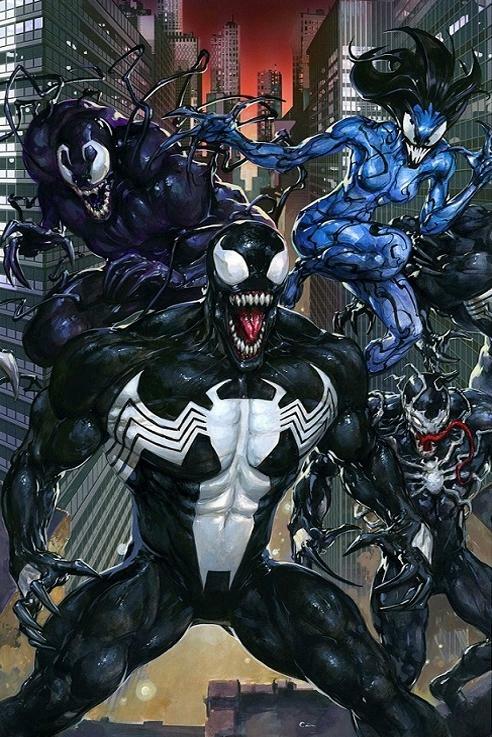 That said, it also means that there are infinite versions of Venom and in Venomverse , a whole load of them, including the one and only* Eddie Brock, are pulled into a conflict with the Poisons a race of creatures vying, and fighting for control of, and against the Venom symbiotes. Dragged into a parallel reality and conscripted into a war that he wants no part of, Eddie / Venom, finds himself battling alongside his “brothers” and “sisters” in a conflict that he doesn’t want to be a part of and wants nothing to do with. But sometimes the most reluctant warriors make the very best soldiers and before he can think of consuming Spider-Man with a nice Chianti, he finds himself front and centre trying to win a war that, the day before, he didn’t even know existed. *Of course, you and I know that in the multiverse there are endless variations, and versions, of Eddie Brock. But as far as Venomverse and this story are concerned there’s only one. Hence the use of one and only.